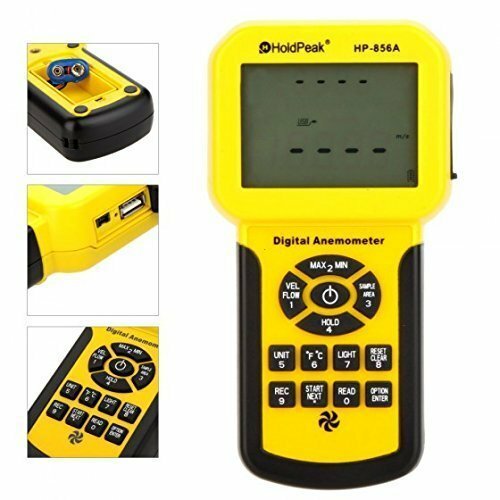 Generally, this HOLDPEAK HP-856A Digital Anemometer is one of the popular products in the market. With the help of this digital anemometer, you can easily measure the velocity of the air, air flow, and the temperature simply. Moreover, the company provides the USB cable to view the reading on the Anemometer display. In addition, this Anemometer works automatically which means it can able to power off the whole system automatically. Not only that but also it allows you to switch off it manually. However, this USB anemometer is light in the weight so you can carry it in your bag while you enjoying the outdoor activities. The display of this digital Anemometer is quite large so you can easily view the temperature range easily during the daytime. However, the readings are mentioned in the 4 digits so it is easy to read and you can understand it easily. As I said before, this anemometer has the ability to work automatically so it will power off the system every 20 minutes of time. Yes, this Anemometer was designed using the latest technology so it works differently from the other. Besides, it will analyze the wind speed and it provides the accurate result to you. Furthermore, with the help of this Anemometer, you can able to measure the wind speed in 5 different types of the units. The back portion of this Anemometer holds with the high power backlight so it will useful for you during the night time while you are involving in the outdoor activities. It indicates you while the battery goes to down. To sum up, for easy to operate this digital Anemometer the company offers the user manual. The instructions in the manual are understandable so surely, you will enjoy the comfort of use it.